Take Netherland Inn Road to Netherland Inn. Park there and walk along the Greenebelt towards the bridge. 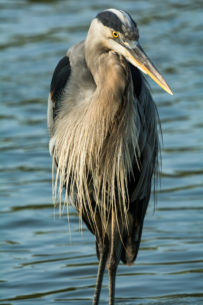 For almost two weeks I have spent my mornings with the same Great Blue Heron along the Holston River. During the two weeks I have developed some trust, I feel he recognizes me and knows I am not a threat. He has gotten to where he will almost come right up to me. All I do is set very still, in the same place for a long period of time. I never try to feed them, all I do is observe and as he gets into positions I like, I photograph him.